ixigo.com is the leading travel website for destination search and tour planning in India. Find comparison of the best deals in hotels, trains, flights, and travel packages, all at one place. ixigo.com aggregates information from hundreds of travel sites to bring to you a range of offers and deals. With ixigo.com, you can always plan your travel better. Check out the Trip Planner to find custom travel itinerary for your next holidays. Find the fastest and cheapest flights and buses at the click of a button. You can check realtime seat availability of Indian Railway Trains. ixigo.com is your best travel assistant both over the web and on the mobile. You can use ixigo Mobile Apps for travel, buses, cabs, and train and hotels. You can make use of the ixigo PNR App for checking berth status on a wait-listed ticket and even see the prediction probability of confirmation. 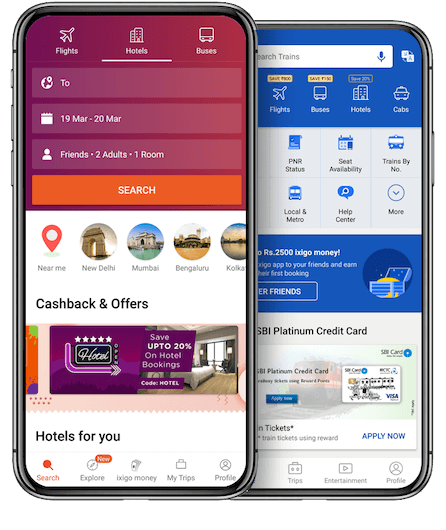 Services and apps provided by ixigo.com are used by more than 7 million travelers in India. So, check out all the services today and avail some cool benefits, such as the lowest fare on flights. At ixigo.com, you can also look for branded and non-branded hotels anywhere in India and book from the best accommodations available at the best prices. In addition, you can search for travel packages for a weekend trip, great beaches, hills, wildlife destinations, and much more. ixigo.com is your ultimate stop for the best travel plans. Explore the website now!